High density dual component dispense cartridges for two part adhesives, epoxies, silicones and other fluids. 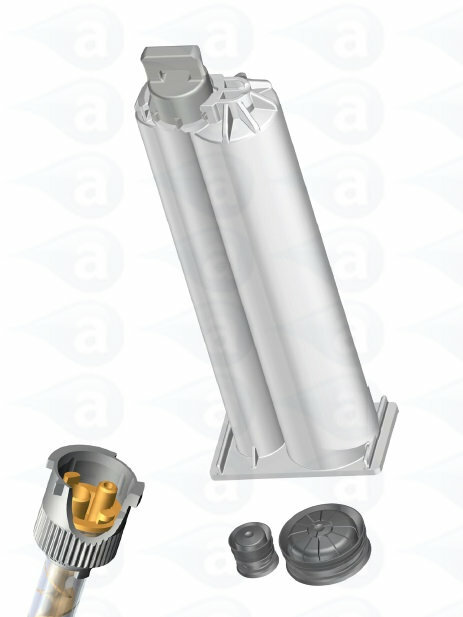 All sets are supplied with matching pistons and a tip cap ready for filling and dispensing. Use with our range of manual and pneumatic cartridges guns. Industrial grade and silicone free. Dual system 50ml size 4:1 mix ratio by volume. Materials are stored in the two chambers of the cartridge system and dispensed simultaneously to the static mixer where dynamic mixing takes place. Use with 2-part epoxies, resins, sealants, silcones & polyurethanes. - 50 x Cartridge 4:1 with capacity of 50ml max. - 50 x Vented large pistons with cap seal. - 50 x Vented small pistons with cap seal. - 50 x Dust tip cap. One of the main benefits of the system is that not all of the contents of the cartridge have to be mixed at a time. When use has stopped, the nozzle is removed for disposal and the cartridge can be closed and stored for further use, without the material curing. Standard air-bleed pistons are shipped with this cartridge system. These dual cartridge products are compatible with either manual or pneumatic dual cartridge guns. Summary: White polypro plastic body. Air bleed wiper pistons. Supplied with pistons and a nozzle tip cap. Nozzle attachment is bayonet twist-on. 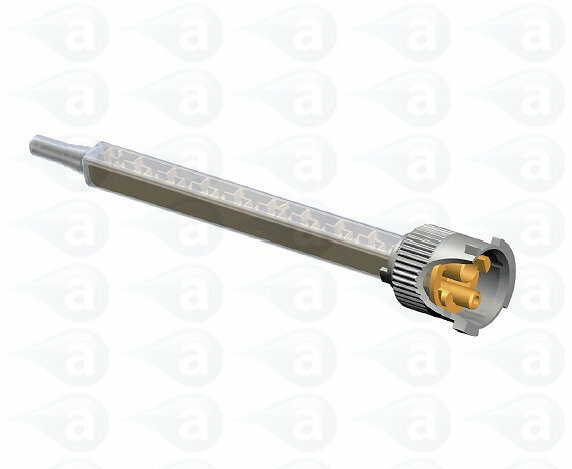 Use (MBHQ) or (MBHX) series mixer nozzles below with these cartridges. Typical Applications:- Deposits of two-part resins, epoxies, polyurethanes, silicones, adhesives and other mixed assembly fluids. Summary: Dispense guns for 50ml dual cartridges in different mix ratios. Manual gun (ABM-25M4) or pneumatic rod-driven gun (EDS408M).